Rachel Hollis is an American book author, motivational speaker and blogger for a website called The Chic Site. She is a proud working mum with four kids that managed to write a self-help book – Girl, Wash Your Face. The book spent more than 17 weeks on The New York Times Best Seller list. She is also the CCO (Chief Creative Officer) of The Hollis Company. Empowering and emboldening women in many different spheres of both their private and professional lives by embracing personal chaos is her passion. As she states herself: “When it comes to women, there always seems to be a question about how we can balance everything. Girl, I don’t even try!”. Rachel has a pretty straightforward attitude of tell-it-like-it-is and her refreshing approach opens the room to authentically connect with audiences everywhere. Her company, The Hollis Company, exists to arm people with all they need to make positive outcome in their lives. The company creates media, products, inspiration and has a huge community that seeks for a better version of themselves on a daily basis. Some call her “The Tony Robbins for women” because of her vibrant and honest style. 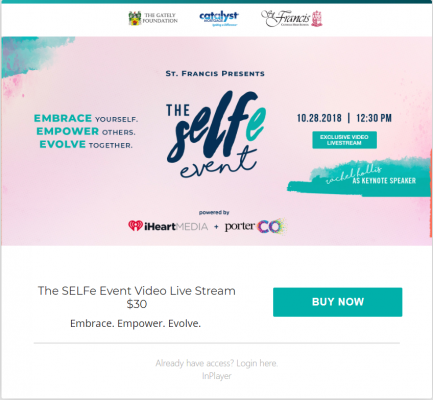 That’s why it is an honor and privilege for InPlayer to support the live stream of The SELFe Event with Rachel Hollis happening Sunday, October 28th, 2018 at 12:30 PM PDT. Rachel will speak at St. Francis Catholic High School for their 1st Annual SELFe Event designed to help women of all ages be themselves. Built on the pillars of service, excellence, and leadership, SELFe is about women inspiring and empowering each other. Whether you live in Miami, or sunny San Diego, don’t miss out on an exclusive video live stream of the SELFe Event on the following link.